I wanted oatmeal this morning however I couldn’t decide what to put in it. I was thinking of my usual peanut butter and banana but I decided to get creative. I started with banana and then remembered the blueberries I had in my freezer. Into the pot went a handful of blueberries, some vanilla and cinnamon. Mmm it tastes just like banana bread with some blueberries thrown in for good measure and it was great with my morning coffee. I am not a morning person and I’m really not awake until I have had my first cup. 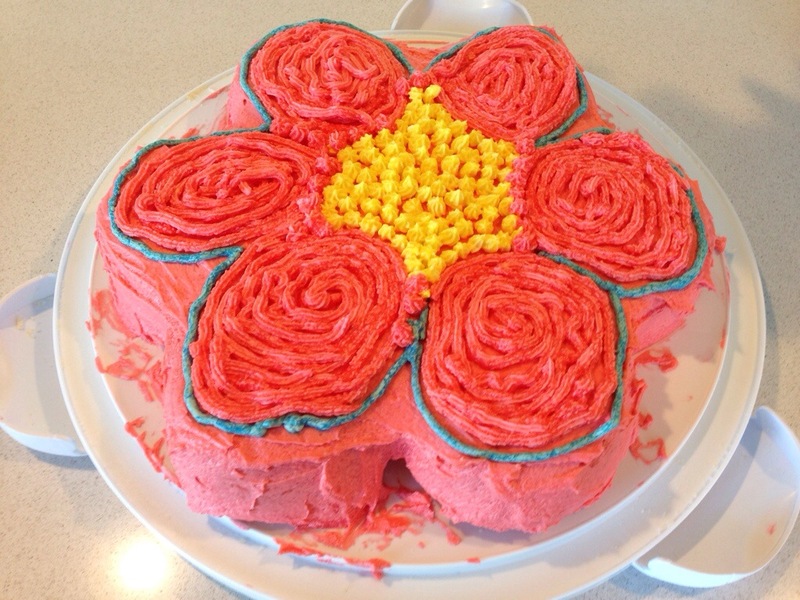 I made this cake for Lily’s birthday party. 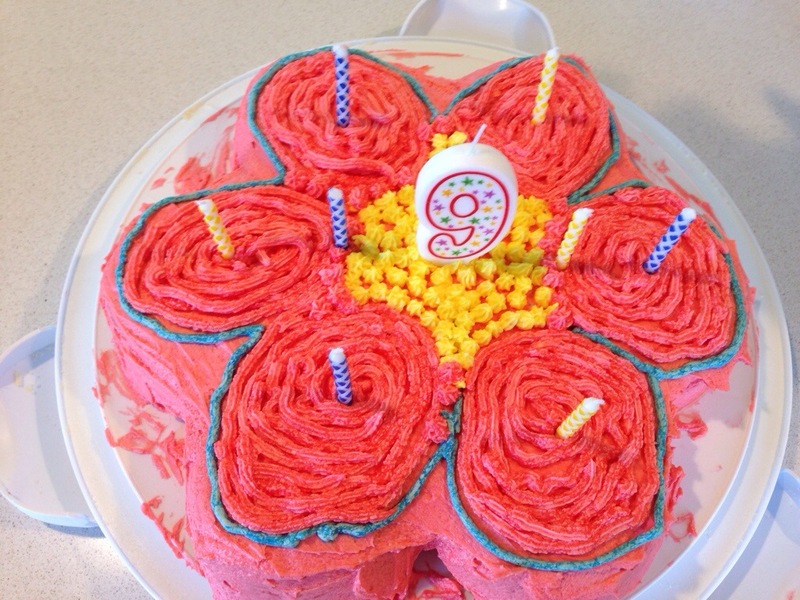 She is turning 9 and what girl doesn’t like a pink flower cake? My first attempt didnt go so well. I made it in a Wilton’s cake pan. I thought that if I baked it the recommended time for a 13×9 pan it would be ok. Boy was I wrong. I baked it early so it could cool before frosting. Jeremy tried to help me transfer it to my cake container, we discovered the bottom turned into a gooey mess. I read the Wilton’s instructions and realized I should have baked it 35 to 40 minutes, oops. So my wonderful Jeremy went to the store at 9pm to get another pink velvet cake mix. He came back with two, just in case. The second attempt turned out much better. I was happy with the way the frosting looks. 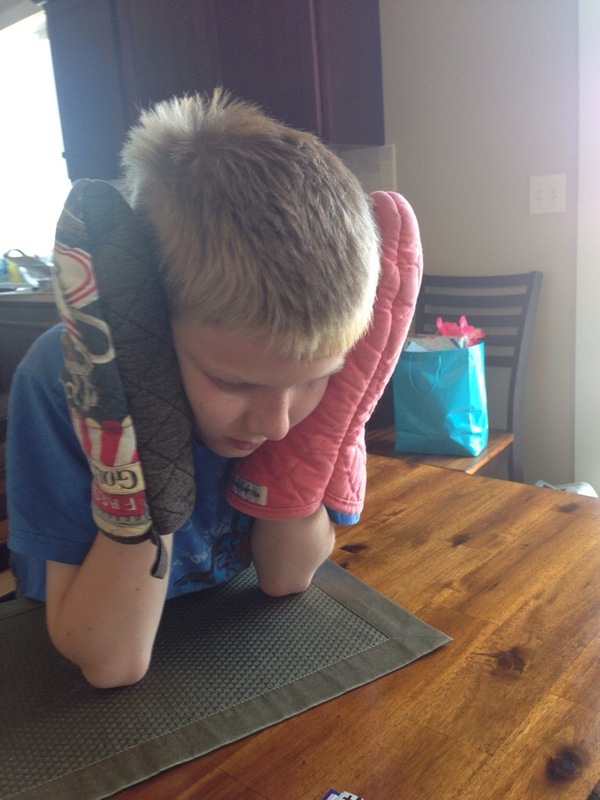 This is how Lyle felt about the cake baking. I made these pancakes for my kids dinner yesterday. I know, pancakes are for breakfast not dinner. We like to play by our own rules sometimes. I was looking for something that I could cook while they were in school that would reheat well. Pancakes are always a hit at my house, and they reheat well. So they fit the bill. The only change I made is adding chocolate chips. My kids love chocolate chips in their pancakes. I only had a few chocolate chips left so I added some cinnamon chips that I found in my pantry. They were amazing. My kids cleaned their plates, then asked for more. Sadly there we no more pancakes. I will definitely make this recipe again. I’m thinking of mixing up the dry ingredients to store in my pantry. Then I will always have my own pancake mix on hand. Way better than the store bought mix I usually use. How much depends on how experienced you are at flipping pancakes and how big you want them. We do about 1/4 cup a time for small, easy-to-flip pancakes but you could make this as much as 1/2 cup of pancake mix. If you are adding fruit, I like to sprinkle it on top of the pancake now. I survived another mother’s day. All in all it was a pretty good day. 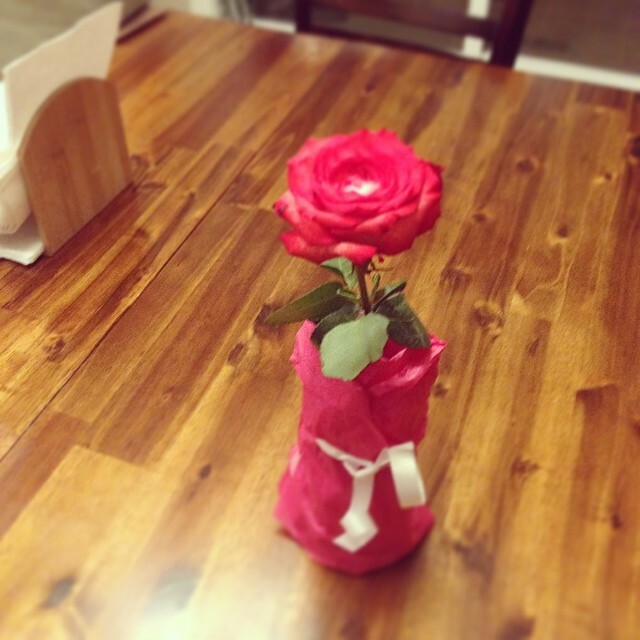 My daughter talked my mom into giving her a few of her mother’s day roses from my brother. I protested that she shouldn’t have to give away her flowers, it was mother’s day after all. But you know how grandma’s are, they spoil their grand kids rotten. So we are driving home, Lily clutching her precious roses. She was pretending to eat them, her brother thought it was funny. I told the kids, you know roses are edible. They thought I was yanking their chain. I insisted, they really are edible, high in vitamin c too, I believe. So after a little research I found out I was correct on both accounts. Its probably a good thing she didn’t eat the roses she had though. It turns out you should never eat a rose from a florist, they are likely to contain pesticides which are poisonous. If I decide to grow roses in my yard I will be sure not to use harsh chemical pesticides. I have never eaten a rose, but now I want to try it.This recipe for Rose Petal Ice Cream sounds yummy. For now, here is a picture of one of the beautiful roses. 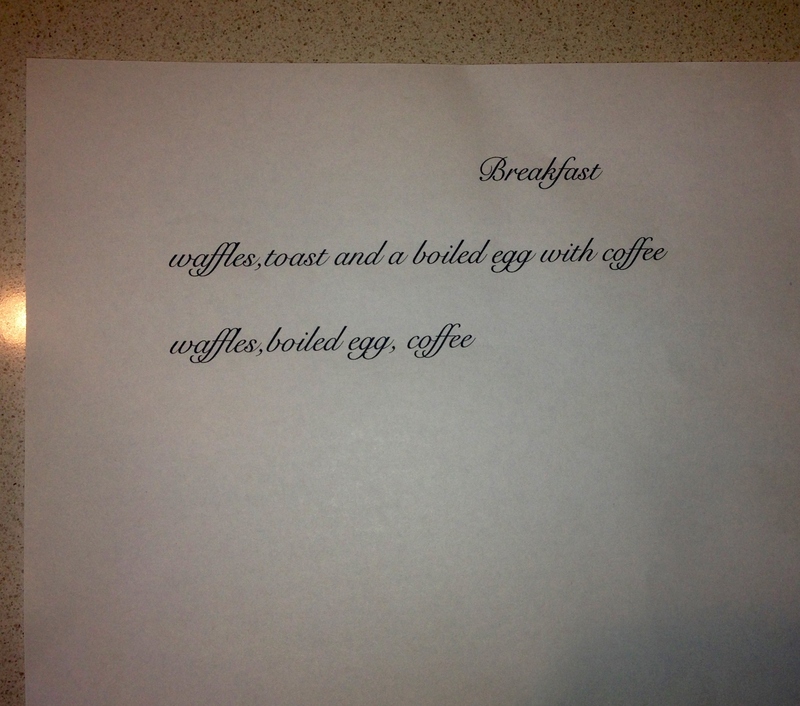 So my daughter has been planning this breakfast in bed for two weeks now. When she announced last night that breakfast would be at 7am I almost cried. Shouldn’t I at least get to sleep in on Mother’s Day? Without my Jeremy here to run interference though I gave in. 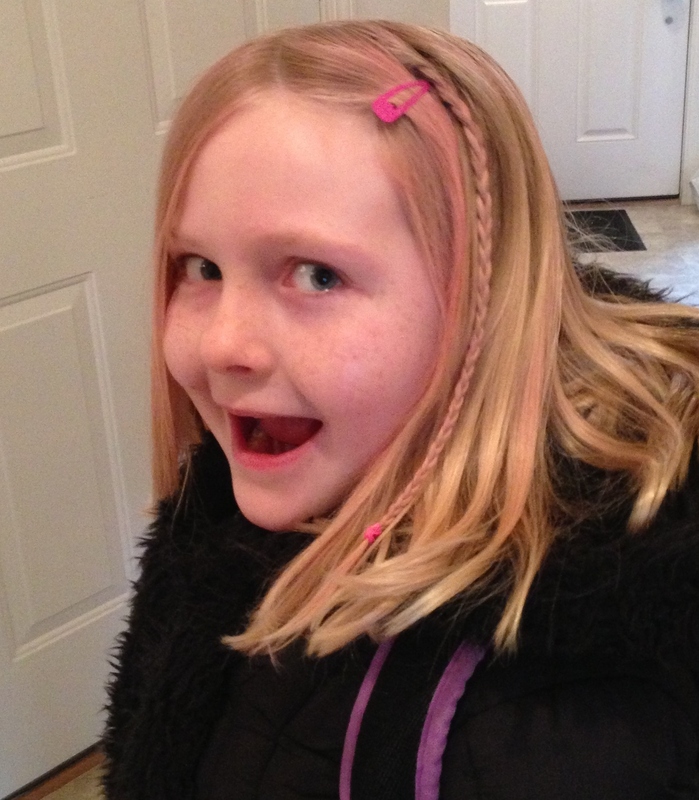 She was so excited for this. 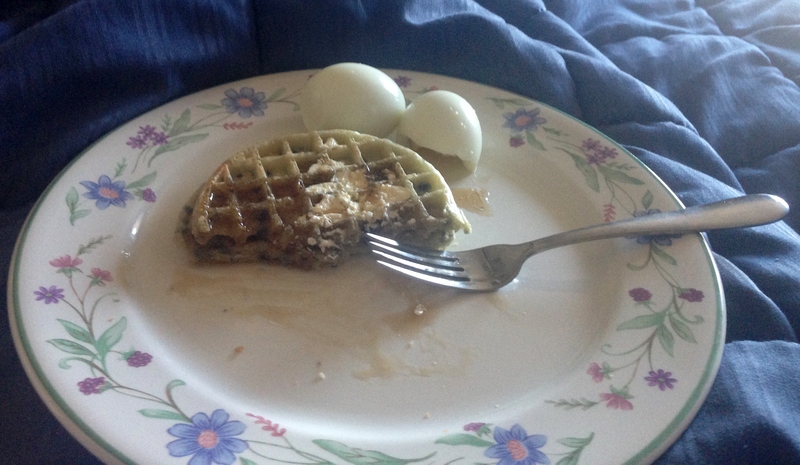 My Mother’s Day breakfast is blueberry waffles, two boiled eggs, and coffee. Lots of coffee. Happy Mother’s Day! Did I mention there was a menu? My kind of restaurant, only two choices! Thought you might want to see a picture of me! I was playing around on Instagram one day and realized I look better in black and white. I think everything looks better in black and white, don’t you? 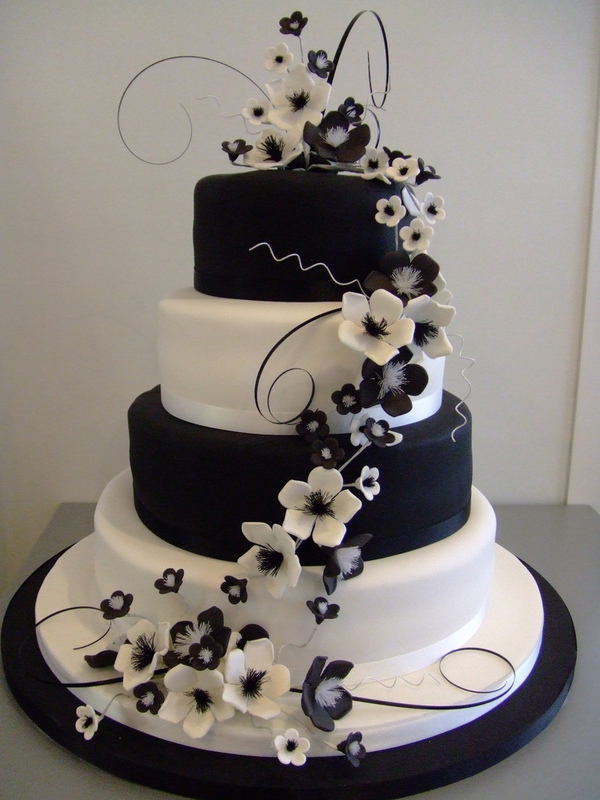 I’m thinking I want a black and white cake for my wedding. I found this picture and its stunning. Though something like this may work too. Its a little more low key, and I could have a sheet cake or cheesecake to go with it. A friend told me recently that your wedding day is only one day of your life, therefore you shouldn’t spend a fortune on it. She said its better to save up and take a really great honeymoon instead. I’m thinking Hawaii. 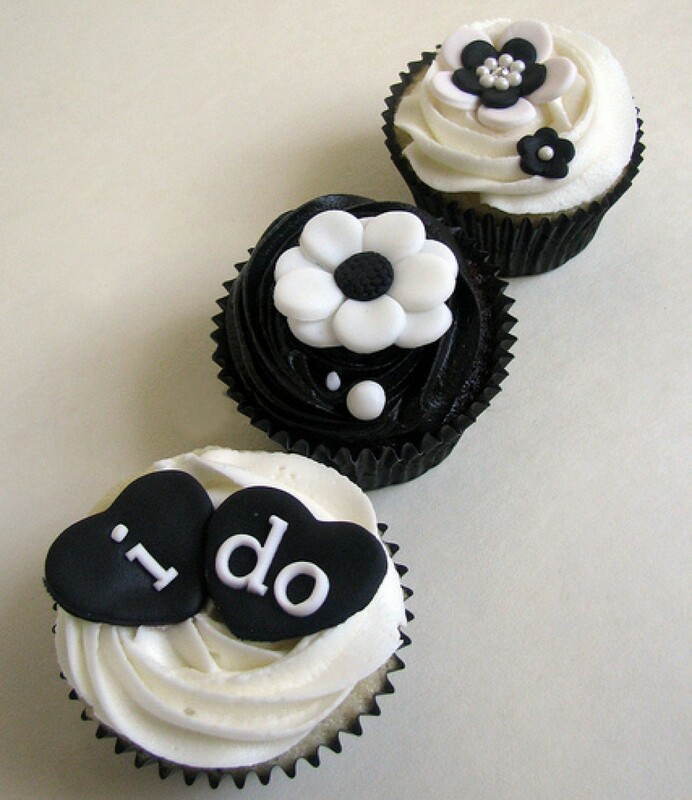 Did you have an amazing honeymoon? Tell me where you went. So, I was just having a lazy day today and reading a book I picked up from the library when I found a recipe in it for coffee cake. I tried to resist the urge to make it and kept reading the book. Two pages later I went back to the recipe, just to see if I had all the ingredients. Turns out I did have all the stuff I needed to make the cake. Next thing I know I was in the kitchen, starting the oven and getting out my mixing bowls. My kitchen looks like a tornado went through it, but my kids loved the cake and so did I. Just wish my baby was here to try it too. I didn’t think to photograph it before we tried it, but here is a pic of what is left. 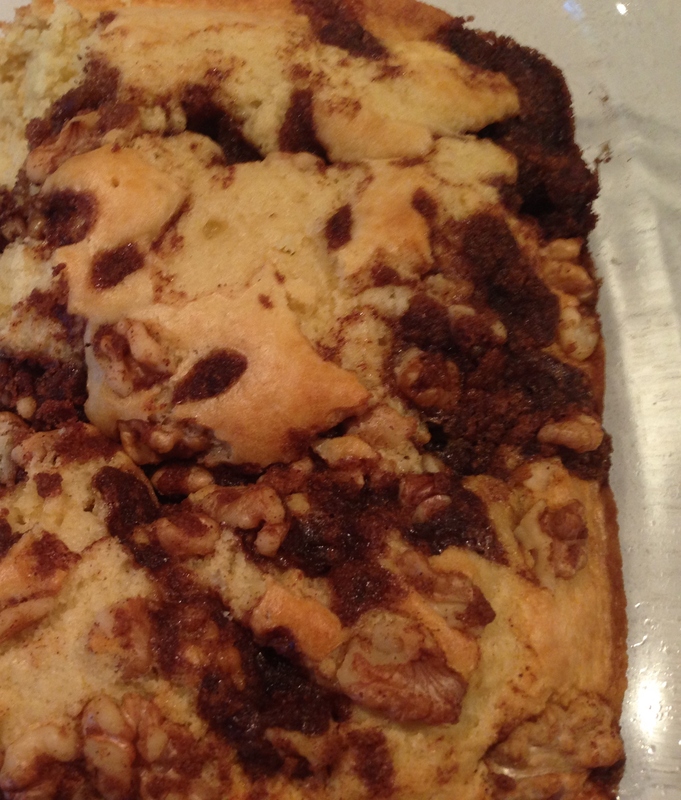 I think the design is kind of pretty, its the result of a cinnamon/walnut topping.